Amanda Smith: Happy Birthday, Maria! Today is my big sister's birthday! Happy birthday, Maria! I've actually had this card completed for a while now. I've been keeping it on a shelf in my room (except for when Maria visited, in which case it was hidden) to inspire me for a while. Now that it's handed off to its intended recipient, I'm going to miss having it around! My sister is a major (sometimes)foodie, so of course I had to make her a food-themed card. And what's better than ice cream? Nothing, that's what. 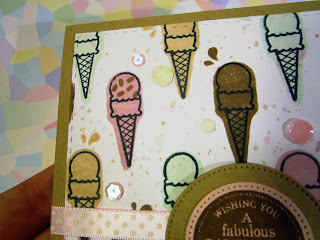 So we've got a delicious ice cream card for her, with creamy vanilla, chocolate, strawberry, and mint colors. The ice cream stamp set I used is from Hero Arts by Lia Griffith, "Oh Happy Day." I wasn't happy with the "drips" that came with that set, so I borrowed different ones from my Lawn Fawn "Lovable Legends" stamp set. It's a top-folding card on a kraft base. 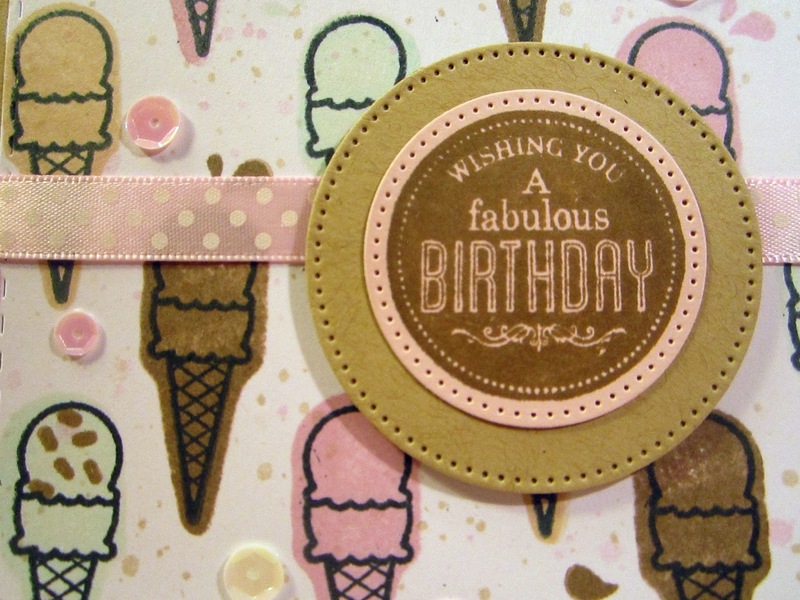 A sweet pink polka dot ribbon wraps around and is topped with a circular birthday sentiment. 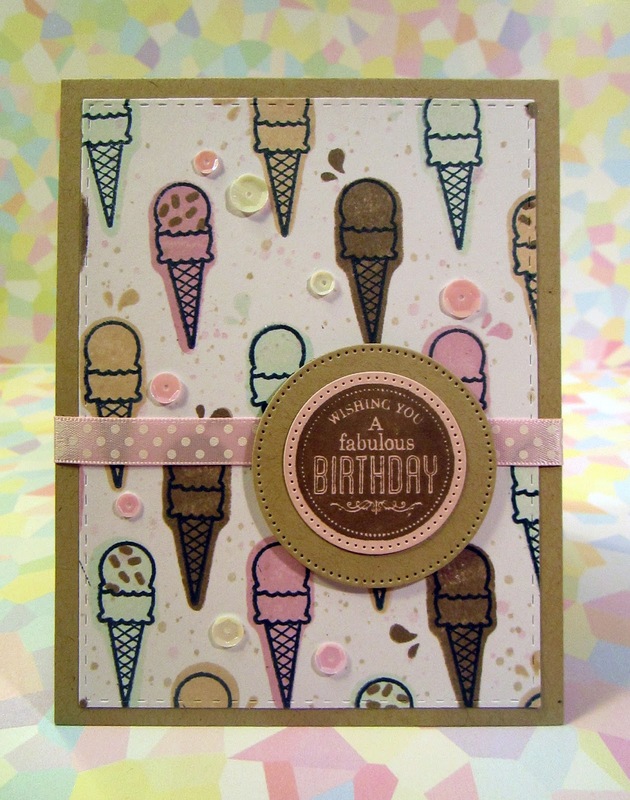 The sentiment fit perfectly into the layered pierced circle die cuts! 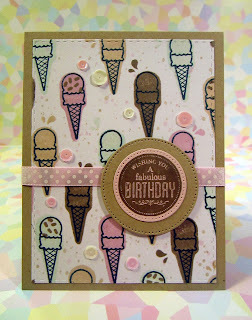 My sister Maria actually bought this birthday stamp set for me, it's by Ready Set Stamp. She's always been super supportive of my crafty hobbies. 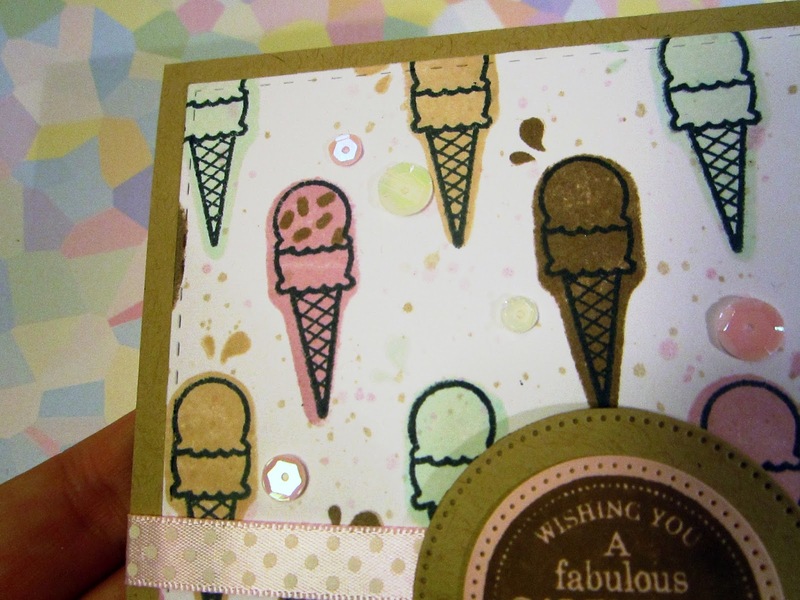 I finished the ice cream panel with some splatter in matching colors as well as a few sequins. These ones were sent for free along with an order from Neat & Tangled and I can't say enough how much I loved them! I forgot about them until the card was complete, so they were added as a bit of an afterthought. 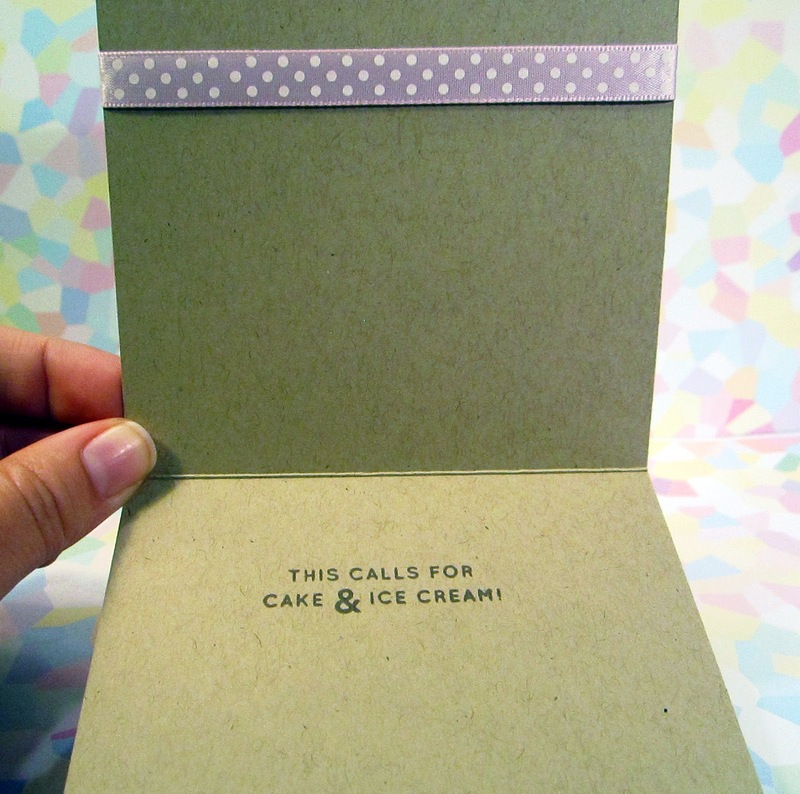 But the pink matches perfectly, and the off-white ones had a green iridescence that matches the mint color so well. Happy coincidence! And they really finish off the card front. 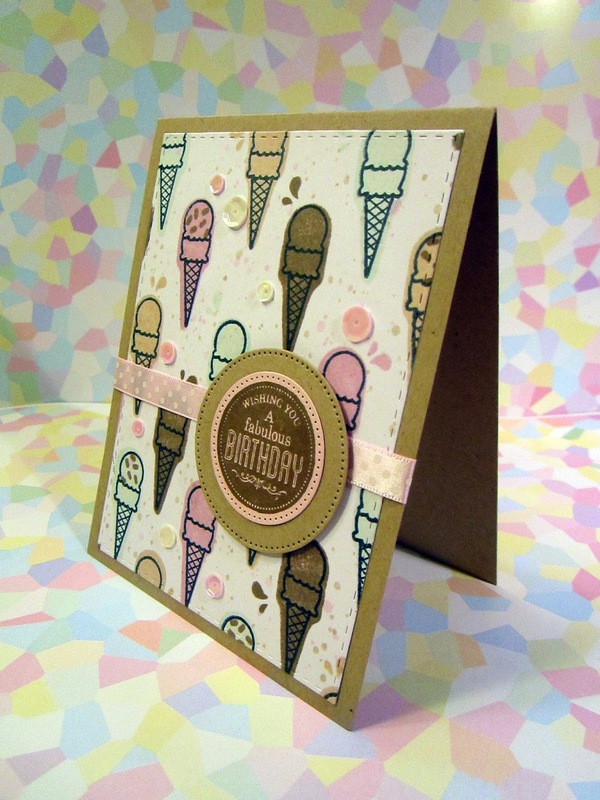 Of course the message inside had to reference ice cream, it's from the "Birthday Messages" set by Simon Says Stamp. And that's it! I have to say, this is by far my FAVORITE card yet, out of everything I've made. I hope Maria has a great birthday, and loves this card as much as I do!